Las Vegas police say an impaired driver hit and killed two jaywalking pedestrians Thursday night on Las Vegas Boulevard near Silverado Ranch Boulevard. Las Vegas police say an impaired driver hit and killed two jaywalking pedestrians around 6:30 p.m. Thursday on Las Vegas Boulevard near Silverado Ranch Boulevard. Officers say the accident was 100 percent preventable, calling it a "double whammy." 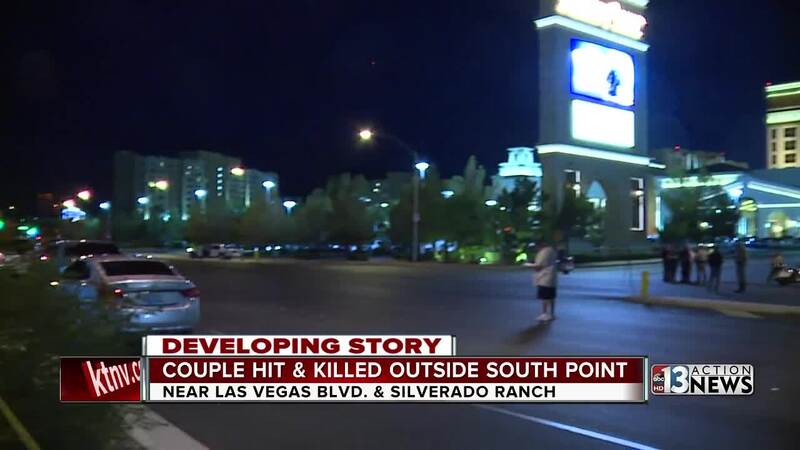 Investigators say a husband and wife from Meridian, Idaho, were jaywalking across Las Vegas Boulevard leaving the South Point hotel-casino when they were hit by a white Ford Crown Victoria. The couple has been identified as 67-year-old Linda Cangro and 68-year-old George Arthur Cangro. Officers say the driver failed several field sobriety tests and was arrested on suspicion of DUI. He has been identified as 26-year-old Davon D. Smith of Las Vegas. Police released a mug shot of him Friday afternoon. The captain of the traffic bureau said the driver likely would have avoided the jaywalking couple if he wasn't impaired and voiced annoyance at the string of decent DUI deaths that began over the Labor Day weekend. "Very frustrating. We are just getting out of a very bad weekend where had 3 fatalities just in our jurisdiction, all that had some form of impairment associated with them," Captain Nick Farese said. The section of Las Vegas Boulevard near the crash site reopened just before midnight.